Get Oiled Before You Start! Install a Preoiler and Lubricate Bearings, Pressurize Lifters, Lubricate Cams, and Lubricate Valves. The British Columbia, Canada, government has granted conditional approval to a controversial project to ship aviation fuel up the Fraser River and then by underground pipeline to Vancouver International Airport. The approval, which includes 64 legally binding conditions, was announced and follows years of debate over the potential risks of fuel-laden tankers plying the Fraser. It was a truly Canadian quest for the perfect hockey game: eight players boarding four helicopters to search the North Shore Mountains for the ideal frozen lake to play on. But no player's slapshot is getting anywhere near the attention of a shot pilot Bradley Friesen took while his helicopter skated between two groups of players, which raised eyebrows after being posted on YouTube. The joint venture will provide supply chain solutions, including component and spare parts support to Bombardier Q400, DHC Dash 8 and CRJ aircraft operators and maintenance, repair and overhaul providers. The business will initially focus on the Q400, but the parties expect to expand the venture's services and offerings to include other regional aircraft types. General Electric recently held a contest for the online engineering community to help solve one of its biggest aviation challenges and knocked it out of the park. The aviation giant asked "makers," or do-it-yourselfers with engineering experience, to take a conventionally manufactured metal jet engine loading bracket and reimagine it for 3-D metal printing manufacturing to achieve a lighter weight, but still maintain its strength. The community response was outstanding — nearly 700 designs were submitted from 56 countries. Last year, the showcase military teams were grounded by federal budget problems, but for the 2014 airshow season, both the USAF Thunderbirds and the Navy's Blue Angels are back in full force. The Thunderbirds released their full schedule at the International Council of Air Shows annual conference, and the Blue Angels also announced an updated and revised schedule. The best customer service for over 20 years! Stocking aviation’s highest quality pilot supplies, Calgary Pilot Supply delivers. Owned by a pilot, we make sure customer satisfaction is our number one priority. 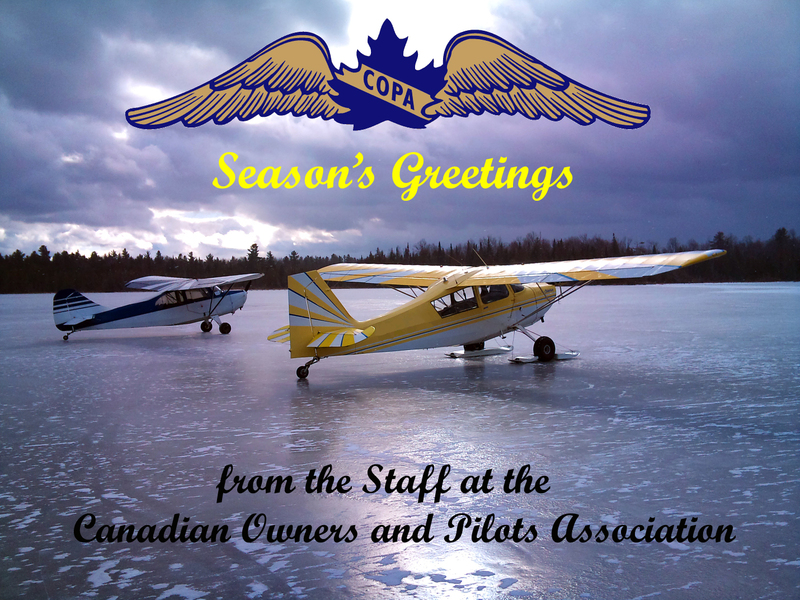 A proud COPA supporter and the official Century Flight Club supplier! In spite of a mountain of uncertainty facing the biofuels industry, aviation biofuels continue to gain momentum. Unlike the incumbent conventional biofuels industry, the entirety of the aviation value chain is readying for takeoff as the industry marches toward broad-scale commercialization. Recent industry headlines demonstrate a high-level of coordination among stakeholders. Look what's landed in Toronto. Introducing PrecisePilot’s certified full-motion flight simulator. Now you can keep your skills sharp over the winter. So why not shoot a night ILS into JFK on the way home from work? Fly anywhere in the world, for fun or for your logbook. Call us today: 905-370-0471 or visit us online. Proudly administered by COPA's industry partner - the Magnes Group Inc. Effective Policies incepting October 1, 2013, we welcome our new Underwriter: AIG Insurance Company of Canada. The National Championship Air Races will go on as planned in September, thanks to a show of support from the Reno-Sparks community and around the world. That's a testament to the popularity of the event, as well as its importance to Northern Nevada as casino gambling continues its spread throughout California and other states looking for an easy way to increase tax revenue. It’s also a testament to the hard work of the Reno Air Racing Association board and staff. I don't think this will surprise anyone: Cessna 162 production is about to be ended. Recently, at the National Business Aviation Association convention, Cessna CEO Scott Ernest stated that the Skycatcher had "no future." Reps. Todd Rokita, R-Ind., and Sam Graves, R-Mo., have introduced a bill in the U.S. House that seeks to abolish the third-class medical certificate for many pilots who fly recreationally. The General Aviation Pilot Protection Act of 2013, co-sponsored by Reps. Bill Flores, R-Texas., Mike Pompeo, R-Kan., Collin Peterson, D-Minn., and Richard Hanna, R-NY., would require pilots who fly recreationally to hold a valid driver's license in lieu of a third-class medical certificate and operate under specific limitations. No matter when, where or what you fly, you want your maintenance to be the best. The best is Sealand Aviation. This past summer, the government said it received a bid from a broker to coordinate the sale of the plane, which was used by the premier and cabinet ministers. The government also said at the time that three companies submitted bids to provide executive charter flight services for five years. But the government now says none of those bids met their required guidelines.